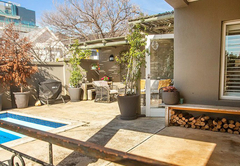 Sarahs Spot is a property providing self catering in Sea Point for up to 4 guests visiting the Atlantic Seaboard region. 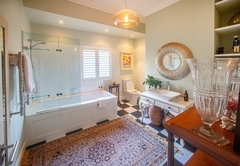 Sarah's Spot is a beautiful villa offering accommodation on the border of Sea Point and Bantry Bay. It is just a five minute walk from the Sea Point promenade and is the perfect holiday accommodation for a family or two couples. 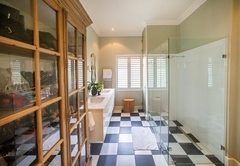 The self catering villa has two bedrooms; the main bedroom is furnished with a Queen-size bed and has an en-suite bathroom with a shower. 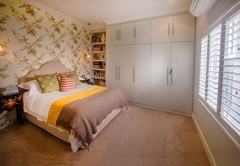 The second bedroom has a double bed and makes use of a separate bathroom with a bath / shower combo. The main bedroom is air conditioned. 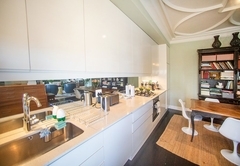 The kitchen, dining and living area are open plan. The kitchen is fully equipped for self catering and there is a separate laundry room. 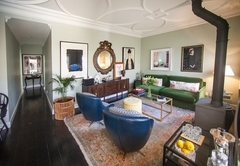 The living area is comfortably furnished and boasts beautiful art. 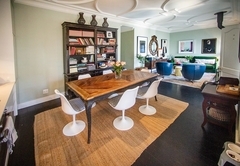 There is a separate TV room and a dining area for six. 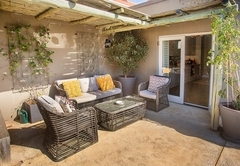 The villa has a wonderful deck and pool area to entertain during the summer months. 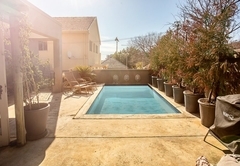 This is a stunning 2-bedroom villa situated on the border of Sea Point and Bantry Bay on Towns Atlantic Coastline. It is about a 5-minute walk to the famous Sea Point boulevard. This is the perfect accommodation for a small family or two couples.